Huh. One stop for everything. Maybe Fred is thinking that Wifi-ers will come in to check prices on-line, or buy stuff at the chain's eponymous website. ETA: Checked it out. Looks to be a dash-in pick-up station. I am guessing that you'd place your order via phone or on-line, a picker wanders around the store collecting everything, and it's waiting for you at this convenient space. Last year Fred's consumer polling panel had a lengthy questionnaire regarding dash-in service for [email protected]; maybe they are testing it here. Placing orders online and picking up at the store sounds like a huge time saver. I hope the idea takes off. Meijer seeking to get itself out of being sued by Acme Twp. Officials. Awhile back before Meijer was fond to have violated campaign funding laws. Acme Twp. officials agreed with meijer not to sue the company. But the campaign funding violation changed everything. A local judge freed township officials to sue meijer. So now according to this article Meijer is intending to file a motion that would free them from any lawsuit from township officials. I would like to know if they ever built a new furniture department elsewhere at the standale meijer and if it now carries foods such as science diet and stuff like that? Nope. The Furniture Dept. at the Standale store is history. The Pet dept. does feel allot more spacious and does have more offerings. But no Science Diet pet food is there though. Also some additional changes happened at the Standale Store. The Books and Magazines were moved from E4 to an area directly behind Floral and Gift Cards and enlarged. With Books and Magazines out of the way E4 was enlarged and product offerings greatly expanded. Looks like things could get really ugly for Meijer top brass...including Hank Meijer himself. Tonight, I took a trip over to the meijer store on Clyde Park/54th. There is some construction going on over at that store. We will start in the front promenade of the store as some changes are taking place there. The bakery which used to be there has now moved over to the produce department area. Where the bakery used to be will soon become a bottle return room. The bottle return room is actually in a temp location of the store. It is located next to the new bakery department. If you notice outside of the store on the left side of the grocery entrance, there is wood on the building. I am assuming that it will contain an entry into the bottle return room. Next off, where the walk in medical clinic used to be is still vacant. Heading over to the produce department area: You will notice that there's a bit of construction in the area. What used to be the cafe area where tables and chairs once were at is now a cart storage room. If you go into the grocery entrance of the store, to the right of the entrance is the cart room with all the carts stored inside there. The Deli and Delicious to Go departments have traded places. Deli is now in the location where Delicious to go was and Delicious to go is now where deli used to be. To the left of delicious to go if your in the produce department is a bottle return room. That is just a temporary bottle return room. There actually used to be a bottle return room by where milk is at. Now it's mainly backrooms in there. Once the bottle return room moves to it's new location, the temporary bottle return room will contain the cafe area with tables and chairs. Currently, there is no cafe area to sit and enjoy snacks at. To the left of the new bakery is now where all the break stock is at. That may still be a work in progress area. There isn't much lighting there and the shelves only appeard to be about 80% stocked. There are sales on some breads so they may also be out of stock as well. Heading towards the frozen foods/meat and seafood section. There are taking out old coolers and installing new coolers which was really needed. There is still one cooler that has yet to be removed. There are currently 2 new frozen food coolers installed. They will be installing another frozen foods cooler or 2 yet, but it won't be where the old white cooler is currently at that will soon be removed. The other frozen food cooler will be on the other side of the new frozen food cooler that was just installed not too long ago. The coolers that were installed appeared to be fully stocked, but some of the products in the coolers may just be in temp locations. Where the old cooler that has yet to be removed will soon be home to an expanded grocery section it says. And where yet another frozen food cooler or two has yet to be installed, it said it will be home to the newly expanded frozen foods section. If your in the grocery section of the store by where the milk cooler and dairy coolers are at, past the dairy cooler, you will notice what looks like new jet black coolers there. They contain some meat and cheese products. Not sure if those are permanent or temp locations. Over in the area, there was plastic hanging up there. They are in the process of getting ready to install new meat coolers and other coolers there. The old meat coolers were removed and unless I'm mistaken, packaged meats in the coolers are unavailable. Unless anyone has noticed, I don't think there is any remodeling of any sort taking place in the retail section of the store. Then again, I don't shop at that store often. I usually shop at Alpine. Other things I noticed. The tile floors throughout the store really need to be replaced. They are in pretty bad shape in some parts of the store. Also, I think it would look better if there wasn't drop ceilings in the store. Why can't they take out the drop ceilings and have an open roof truss system like the Alpine Meijer? I did say that there was a new cart storage room to the right side of the grocery entrance, but there isn't one at the retail entrance. The reason why it maybe like that is that the retail entrance vestible is big enough to have carts stored there. Compared to Alpine Meijer, I think the grocery section at the Clyde Park Meijer is much smaller than Alpine's grocery section. Well that's all I know so far. Today I took a brief trip over to the Clyde Park Meijer store to pick up pictures I wanted developed from my digital camera memory card and I noticed a cement truck laying down new cement in the area which may soon be the new bottle return room. I went into the store via the retail entrance. Because this was a quick visit to pick up pictures, I did not go down to the grocery section to see what was going on. So I don't have any updates as to what was going on in the grocery section of the store. The Clyde Park Meijer had its retail section renovated to the current prototype about a year or two ago. However in that renovation the grocery section only received cosmetic changes to match it to the new look of the retail section. I don't know why the drop ceiling was retained though since the roof of the building is nice and flat. Perhaps store management thought the drop ceiling was in satisfactory condition and thus chose not to spend the money to have it removed. Personally I'm not a fan of drop ceilings in spaces like Meijer. The flat roofs of such buildings are always prone to roof leaks while drop ceilings have a very bad habit of getting those really unsightly brown water stains. However in more upscale places like Macy's drop ceilings adds weight and substance to the interior which can compliment the high end look of their posh sales floors. PC Doc, please keep us up to date on the Clyde Park. Well I don't know if I will be going out to the clyde park store again in the near future. I was staying at my dad's last night and he dosen't live that far from that particular meijer. He lives on the SW side in Wyoming and I live on the NW side in Grand Rapids. Last time I was out at that particular meijer before I went yesterday was like a year ago. Hopefully those that do visit the store frequently will post updates as to what's going on there. I was out in Muskegon yesterday, and stopped by the Norton Shores store to see how the renovation is going there. The northern addition with the new grocery section is already nearing completion. Looking through the wall inside, It appears that the addition is maybe a couple weeks away from being ready for the move. The lights are on and coolers are installed. You can see from this view how much of the old building will be demolished once the grocery section moves. The former seasonal area has already been demolished. In addition, interior renovations of the retail area are starting (removing tiles and painting the ceiling, replacing floor tiles, etc.). Looks like things are going well over there. 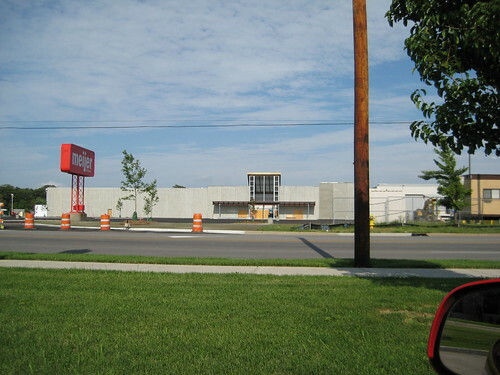 One thing that interests me is the same precast concrete wall panels employed in the construction of new Meijer stores are being used in the Northern Shores renovation. That's a departure from how the Alpine and Jenison stores were renovated. The additions tacked onto those two stores are made of traditional cinder block walls as are the original structures. So I wonder how contractors are going to blend the precast walls to parts of the original Northern Shores store left intact. Looks like an Acme Twp. official is resuming his lawsuit against Meijer. This time he's adding Meijer's attorney to his hit list. Went to grab a few things from the River Town Crossings Meijer since I was in the area. The two "Meijer Fresh" signs, one on the front of the building and the other on a projection above the garden center canopy have been replaced by new signs reflecting the current joy dots logo. Inside, the store looks as it was when it was built back in 2003/4. However a few changes have been made inside. The cafe area received a new paint job. In the front of the store, the photo studio and one other service tenant have been replaced by a Chase Bank about doubled this size of the one in the Alpine Ave. Meijer. Lastly checkout lanes one though six are now U-scan lanes arranged in a 3x3 configuration. Lanes 4 though 8 are now full sized self check out lanes. Lanes 9 and 10 are two tobacco lanes. Lanes 11 on up are what is left of the old double row lanes first installed six months after the store was built. Over all the store still looks good and up-to-date and felt spacious despite being very busy. The updates made to the store should hold it over for another few years. Though I would like to see cart rooms added. I hate that one. Impossible to get to, all those silly access roads and drainage ditches. Jenison is confusing due to the street pattern, but at least it's easier to reach. Impossible to get to, all those silly access roads and drainage ditches. Huizinga Intercounty Drain - carries a lot of water when it rains hard. Floods neighborhoods when it is clogged. Tip: It's much easier to get to the Rivertown Crossings Meijer from Ivanrest Ave. This way avoids most of the Mall traffic and the confusing service drives. Good luck finding a descent parking spot though. No help there because that store is always crazy busy which is the primary reason I don't go to that one all that much. Oh while I'm here, where's something weird going on with the checkout lanes at the Standale Meijer. Lanes 7-8 along with 10-11 were closed and all of the their candy racks and impulse buy shelves emptied. Could be just because they are waiting to be restocked. But the rest of the checkout lanes were fully stocked. Another reason could be is that the Standale Meijer could be getting ready to add some full size self checkout lanes and convert Lanes 10-11 into tobacco lanes. Maybe all the meijer stores are eventually going to have full size self checkout lanes. I think I read somewhere that it's going to be a small retail development. This article announcing that a Meijer store being approved for construction in Plainfield, IN seems to indicate that the final nails has been driven in the coffin when it comes to the future of 200,000+ sq. ft. stores. "Lynn Richardson, real estate manager for Meijer, said the company is the midst of changing to the newest design, so about half of the eight new stores opening this year are the larger footprint and half will be smaller. 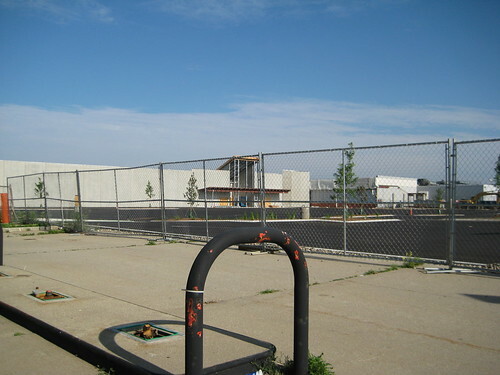 All of the stores starting construction in 2009 will be the smaller size, including Plainfield." So after the quoted transition Meijer stores will be 156,000 sq. ft. in size for the foreseeable future. Personally I think this is a good move on Meijer's part. Like Wal-Mart, Meijer is facing ever increasing community resistance to building new stores, the Acme Twp. hoopla being the most well known case of this. In addition it is becoming harder for Big Box retailer's to find enough land to accommodate there stores. Hopefully Meijer's 156,000 sq. ft format will make future stores more palatable to Big Box resistant communities while enabling Meijer to penetrate deeper into urban cores. What I would like to see is Meijer giving up its standard exterior store design and allowing local architects to skin store's with exterior designs that fit into the local character of communities to receive new stores. Wal-Mart, Target, and many other Big Boxes are already doing this. So why not Meijer?